I’m sure you’ve all heard of pregnancy brain before… right? I swear when I was pregnant I forgot EVERYTHING! Someone would tell me something and I would forget it 5 minutes later. When I was pregnant, I would wear my flip flops on my way to work and change into my fancy heels when I got to work. Well one morning I forgot to bring my heels and mindlessly walked in to work with dress slacks, a cardigan, and flip flops… classy… I know. Needless to say I learned my lesson and always kept a pair of heels in my car to make up for my pregnancy brain. After I had my daughter I was really looking forward to getting my head back in order… and think straight again. Well my friends… I’m here to tell you that pregnancy brain is replaced by mommy brain. Yesterday morning I packed my daughter’s bag, took her to daycare, then drove to work. I felt like something was a little off. Well… shortly after I got to work I remembered my daughter’s lunch bag was sitting on our kitchen counter! How could I do that?! How could I forget to send my 9 1/2 month old to daycare without lunch?!?!!!! Over the weekend I made a batch of homemade pasta sauce minus the meat. I like making big batches of things, especially sauces, and freezing them. Now that I know how to make my own marinara sauce from scratch, I can’t imagine buying Ragu’ again. I’ve mentioned before that I LOVE meals that have all the food groups in one meal. 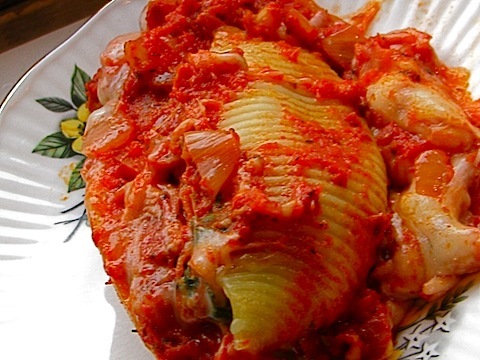 These stuffed shells are perfect for that! 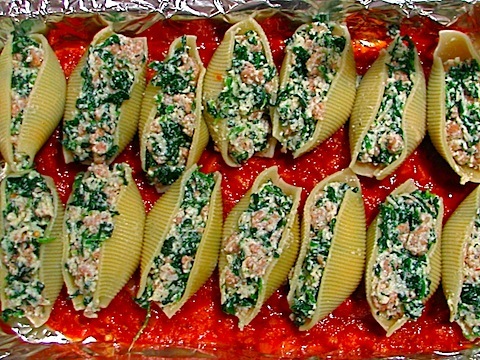 These shells contain lean Italian turkey sausage, ricotta, and spinach. I know they make whole wheat jumbo pasta shells, but I couldn’t them in my grocery store, so I went with the regular shells. This dish was so good! And it contained my husbands favorite ingredient… MEAT 🙂 This dish makes plenty of food so it’s good for lots of leftovers for a quick and easy meal. Remove turkey sausage from casein and cook in saucepan until cooked through. Cook pasta shells according to box directions. Combine turkey sausage, ricotta, parmesan, onion salt, garlic powder, Italian seasoning, salt, pepper, spinach, and egg yolk. In a 13×9 baking dish, spread about 1 cup of sauce on the bottom of dish. Fill each shell with about 2 tablespoons of filling. Pour remaining sauce on top of shells. Uncover and sprinkle with 1/2 cup mozzarella cheese and bake for additional 10 minutes or until cheese in bubbly. this is almost the exact stuffed shells recipe i grew up on. such a good one! i’ve never thought to look for the large whole wheat shells! I totally understand the mommy brain syndrome. After two kids, it’s totally gotten worse for me. It’s pretty sad lol. I also love it when I drop them off at daycare and realize I have baby poo on my shirt and I don’t even care. Haha! I love stuffed shells! My hubby does not since he hates ricotta. Maybe I should make them to get rid of the mustache?? I love stuffed shells! I usually mix soft tofu with the ricotta. I can so relate to mommy brain…I forget things all the time. Now as soon as I make Maya’s lunch I put it by the door so that I will literally trip over it if I try to leave without picking it up! Oh goodness. I think I get wife brain. I make my husband’s lunch. He works out of his car, so there’s nothing to keep his meal cold except for an ice pack. Which I’ve forgotten. Oh, and I’ve sent him off with yogurt and no spoon. We all have brainless days I guess. haha oh im sure i will have a mommy brain when i have kids! Yum! I know this would be a crowd-pleaser in my house too! I have to make this! It’s funny how their needs can be simplified like that but it does cover just about every necessity when we are out and about! My latest mommy moment (even though I am not a mom): Driving to the gym to do Body Pump only to realize that I left my gym bag (with my clothes) at home on the counter. Can’t do body pump in a jean skirt! Haha! My girlfriend and I were just talking about “momnesia” the other day! I totally forgot to bring stuff that was important on our trip last week (ie medications, lotions, etc.) Then, when returning home, I left my favorite Lululemon and Nike workout tops in the condo we rented. Gah! Some days I think I’m losing it! Wow, these looks seriously delish! I don’t eat meat so I will try substituting beans. Thanks for sharing! Your recipe sounds great, as usual. Ah I already have a forgetful mind, so I am not looking forward to it getting any worse! I also make my own sauce – I love how you stuffed sausage into the shells – what a fabulous idea! I could also see stuffing it with beans too! I tossed on a sports bra earlier this week and then a sweatshirt…totally forgot my tank top which was not cool when I got to the gym! The shells look wonderful! I’ve been craving spinach + noodles lately – mmm mmm!